Jaguar Writing Set. Jaguar Statonary Set. Jaguar Gift. Supplied in a nicely printed pouch with gift card. Depicting a Jaguar C Type pit stop at the 1953 Le Mans Race. 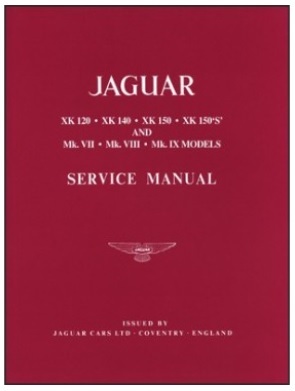 Jaguar XK120, XK140, XK150 (and 150S) & MK 7, 8 and 9 Service Manual. Large book compiled from nine different previous official manuals. 784 pages, photos, drawings, wiring diagrams. Repro of the original HT Lead Spacer Block used on the Jaguar Racing cars. Made from a fibre material similar to the original Jaguar Factory Team Cars which was made from 'Red Fibre' so designed to help supposed induced cross interference which you could get with a metal spacer block. Can be fitted to most Jaguar XK Engines as fitted to XK120/140/150, E-Types, Mk2's etc.... tidy's up the HT leads nicely. Drilled to fit the standard 6mm leads the holes can of course be opened up to fit larger high performance leads. Supplied as photos with the mounting brackets. Bash the wood not your nice chrome spinner when changing your wire wheels. New re-print of the original 1950's book including a FREE Maintenance Chart (A2 size poster). Quote "This Handbook gives the information necessary for the satisfactory operation and maintenance of the Jaguar XK140"
*Operating Instructions - "deals with the operation of the controls and equipment"
*Routine Maintenance - "deals with the maintenance of the various components of the car at certain mileage intervals"
*Service Instructions - "deals with certain operations which should normally be undertaken by a Jaguar Distributor or Dealer, but which are included as a guide for the enthusiast or the owner living in a remote district"